This lovingly refurbished condo in central Tucson is an excellent choice for anyone wanting to experience the Old Pueblo like a true local! 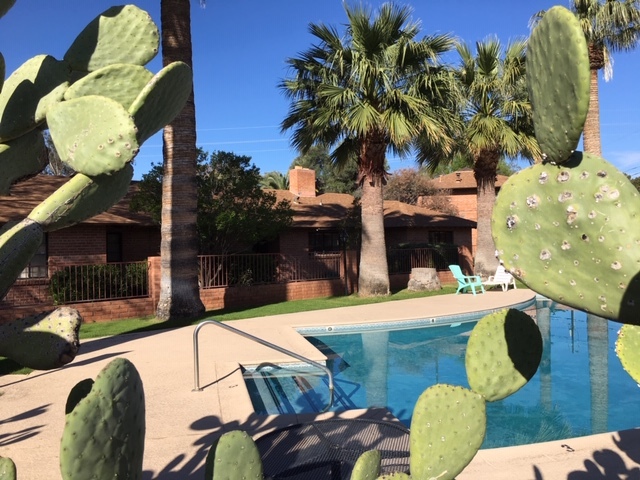 La Casa Del Artistas is a 2 bedroom, 1 bath condo, located in the central area of Tucson in the Historic San Clemente Neighborhood. The condo has been updated with a sleek mid-century modern design and features a sophisticated yet warm ambiance that is sure to please those who appreciate excellent design and modern sensibilities. The grounds of the complex feature plenty of mature shade trees as well as a variety of citrus fruit trees with a bountiful harvest available for the fresh picking of residents and guests alike! When you approach the condo you will instantly feel relaxed as the front porch offers a lovely sitting area that is perfect for enjoying a morning cup of coffee or evening glass of wine while you take in the courtyard view of well manicured flora and fauna. When entering the home you will be pleasantly surprised by the amount of space in the main living area that has an open floor plan to the dining area with seating for six. This main living space has plenty of natural light and features cool tones of grey, blue and natural wood. The concrete floors are practical and inviting; cozied up by the comfortable couch and two Danish Modern sitting chairs. The furniture is comfortable and perfect for having a nice visit with company, or to lounge in while watching your favorite movie or show on the large flat screen smart television. The kitchen is located just off of the dining area on the south end of the home and is also completely renovated in a modern style and designed with space maximization and convenience in mind. Everything you need is here to create a culinary masterpiece, including a gas stove, whether it's a favorite dinner or a quick snack. You will find plenty of utensils, small appliances, and other accouterments that make cooking and entertaining a breeze. The kitchen also features a breakfast bar that looks out of the kitchen window onto beautiful blue waters of the community pool. As you move past the main living area to the north side of the home you will find the foyer leading to the two bedrooms and bathroom. The first guest bedroom features two twin beds that can be converted to a king bed if desired and continues the home's fresh and uncluttered decor. The bathroom to the immediate right of the foyer features all new fixtures and a newly remodeled walk-in shower that boasts a lustrous glass subway tile backsplash and modern style glass partition. The Bathroom is also where you will find the stackable Laundry unit that is also brand new and of stylish design. In the second bedroom you will find the Queen Platform Style Bed with luxurious and cool bedding that is perfect for lingering in on those relaxed vacation mornings! This room also features a view of the pool. With all of the amenities in the home and community, especially since you are right next to the pool, that also features a communal BBQ and Dining area, you may never wish to leave the home or grounds! But you will be glad when you do go exploring, because you will be delighted to find that you are within walking distance to one of Tucson's best recreational Centers and Parks. Reid Park is one of the Largest Park Facilities in Tucson, Boasting the Reid Park Zoo, The Randolph Parkway Public Golf Course, The Reid Park Aquatic Center, And the Reid Park Outdoor Theater and Bandstand, not to mentioned the Park itself with plenty of walking trails, Two Ponds, Rivers and Waterfalls, and Bicycle Path! Anyone who loves to be outdoors without wanting to have to drive to the mountains will be pleased with the proximity of some of the best Central Tucson has to offer in that department. Of course, if you do feel like taking a drive, La Casa Del Artistas is still the perfect location because you are about 15 minutes from anywhere in the city; including the ever expanding Downtown/University District, and only a short thirty five to forty five minute drive from most major perimeter attractions, such as old Tucson, The Desert Museum, Sabino Canyon, La Encantanda Shopping Center in the Foothills and much more! Plus El Con Mall, Target, Walmart, Starbucks, In and Out Burger and Century Theaters are all one block away! The Historic San Clemente Neighborhood itself is also a quiet community with many walking paths available and several historic properties to enjoy viewing during a neighborhood stroll! And driving is never a bother because your car will be kept cool in the covered, designated parking spot! So if you want to have experiencing one of Southern Arizona's best cities like a local down to an art, than look no further than La Casa Del Artistas!